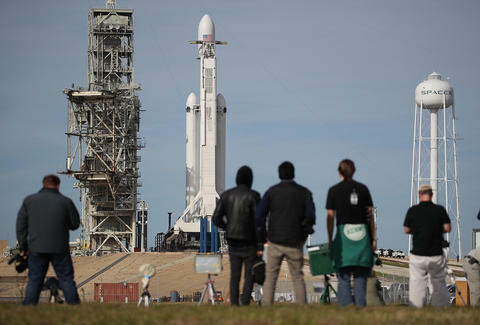 The Falcon Heavy, which has been billed as "the most powerful operational rocket in the world by a factor of two," is launching on Tuesday afternoon from NASA’s Kennedy Space Center in Cape Canaveral, Florida. This launch and rocket come courtesy of Elon Musk's SpaceX after seven years of development and delays. It's set to be a historic moment that'll have huge implications for the future of space travel, and you won't want to miss it. The launch will be broadcast on SpaceX's website and on YouTube (shown below), starting at 1:10pm EST. The launch window was set to start at 1:30pm, but it's been delayed until 3:45pm. If problems persist, SpaceX has another chance to launch from 1:30pm to 4pm EST on Wednesday. What is the Falcon Heavy? The Falcon Heavy is a more powerful version of SpaceX's Falcon 9 rocket and is designed to transport massive shipments into space. It has a capacity of up to 64 metric tons (141,000 pounds). Since today is just a test flight, it'll be only lifting a Tesla Roadster with a dummy wearing a SpaceX suit. Twenty-seven total engines can create 5 million pounds of thrust at liftoff, so this is by far the world's most powerful rocket. Put simply, we can get more stuff into space for cheaper. It can lift twice as much as the next most powerful vehicle but is a third cheaper to launch. This means launching satellites will be easier. It could also be a huge factor in getting vehicles and equipment to the Mars and the Moon -- especially relevant since NASA was recently directed to send astronauts to the Moon again. As SpaceX's launch description says: "Falcon Heavy was designed from the outset to carry humans into space and restores the possibility of flying missions with crew to the Moon or Mars."